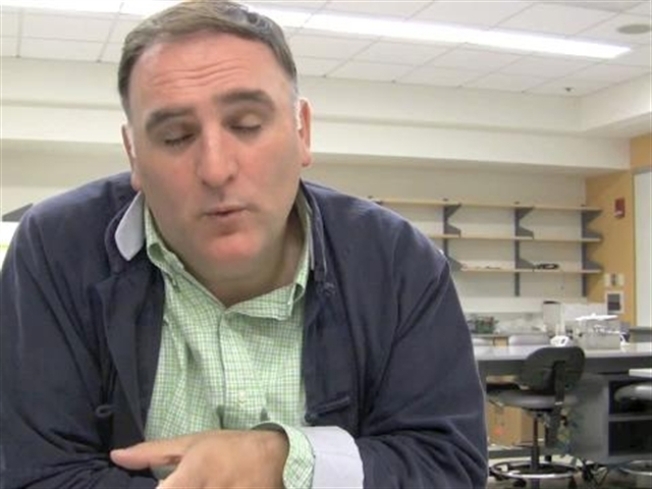 Last week at Harvard University, famous D.C.-based toque José Andrés taught Class No. 2 of the big-deal food science course which is being taught this semester by a rotating cadre of famous chefs. The Feast sat down with Andrés to find out what he's been up to lately. Besides teaching culinary-inclined undergrads and making live TV show appearances, Andrés has been shooting the third season of his PBS show 'Made in Spain,' (he tells us the fourth "will not just be Spain, but traveling around the world"); he's been working on two new restaurants set to open in Las Vegas on New Year's Eve; and in the video above, he explains how he's going to expand minibar by josé andrés in the coming months. His other major ongoing project is through his non-profit organization World Central Kitchen. He wants to build a giant chefs-without-borders ship that'll deploy "the biggest kitchen ever built on the sea" to areas impacted by natural disaster. He describes the strategy as a "Peace Corps of chefs" that invests in farming solutions to empower the affected local economy by docking close to the crisis, sending trucks to farms to purchase and distribute food, and hiring locals to cook for victims. It's an idealist's pipe dream until it becomes a reality, and who's to say it can't? "We have high hopes of feeding the world one day. If this were a private venture I wouldn't talk like this because chances of success are always low," says Andrés. "But Churchill said that success is going from failure to failure without losing enthusiasm." Cathy Huyghe is a contributor to TheFeast.com, a new lifestyle franchise being launched by NBC Washington later this year.